Bathe and dry your dog thoroughly before shearing. Shearing a dog can reduce shedding, alleviate skin diseases and help keep him cool during the hot summer months. With the right tools and technique, you can shear your dog just as well as a traditional groomer would without the added expense or the stress of having to leave your dog in the care of a stranger. Bathe your dog thoroughly using dog shampoo. A clean coat makes it easier to get an even clip when shearing. Dry your dog's coat. A wet or damp coat could damage the blades on your shear and lead to an uneven clip, so use a towel and allow ample time to ensure that you dog's coat is absolutely dry before beginning to shear. Brush your dog. Use a dog brush to comb your dog's fur and remove as many mats as possible. For best results, brush your dog's fur against the grain. Leash your dog. Make sure that your dog is leashed in a manner that is comfortable but prevents him from wandering away. Select the desired blade and snap it onto the shear. Choose the blade according to the preferred length of coat. Short summer cuts, for example, would require the use of a #10 blade. Longer cuts, on the other hand, would call for a #4F blade. With one hand, hold your dog still and stretch out the area of skin you are working on. Keep the skin tight to get a smooth cut and avoid scraping the skin. Lay the blade flat against your dog's skin and beginning shearing. Work on one section at a time using long, slow strokes. Check for loose hairs that the shears missed and trim them using scissors. Hold your dog's paws steady when trimming around the toes since most dogs will automatically retract their paws. Shearing against the grain will result in a shorter cut. For large dogs with many sections to shear, take a few breaks in between sections. 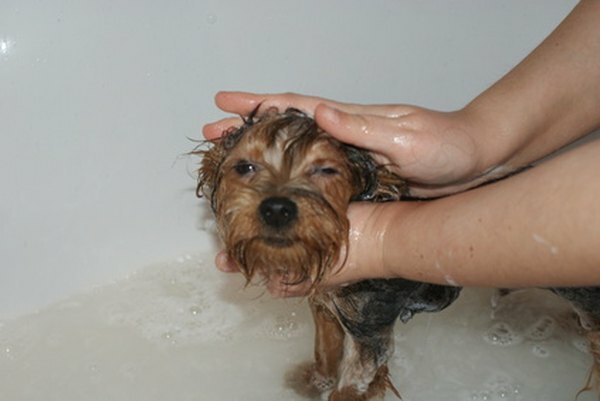 Bathe your dog again after shearing to remove small, itchy hairs. Some shears become hot during use. Frequently check the temperature of the metal blades to avoid burning your dog's skin. Shearing a dog during cold winter months could leave him without vital insulation needed to avoid hypothermia. Summer cuts can leave your dog vulnerable to sunburn. You can protect your dog from sunburn by using a PABA-free sunscreen.